Product code: W237 Categories: Sold Items, Sold Rolex Watches. 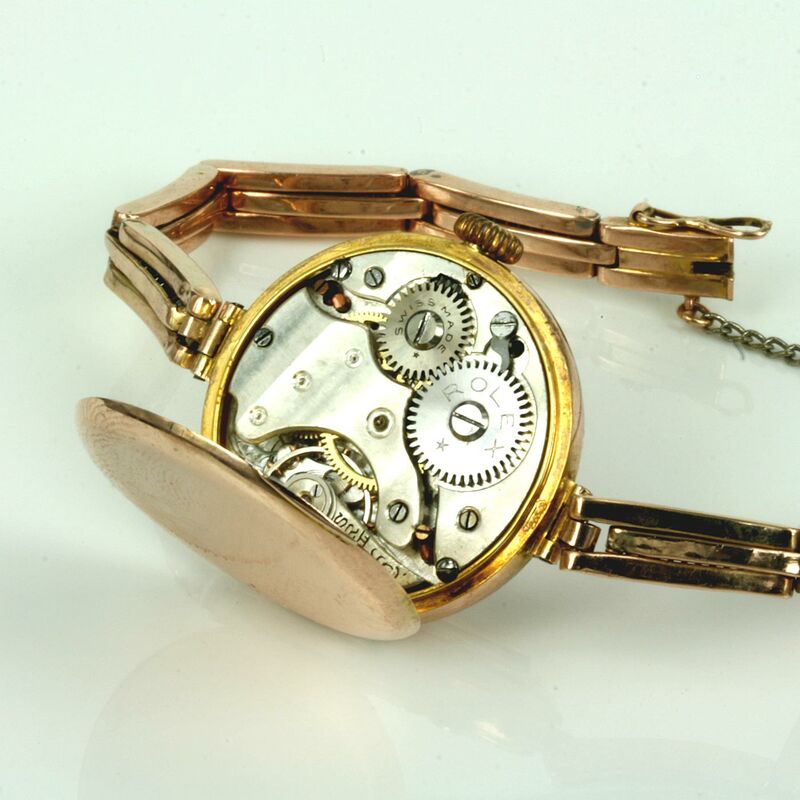 It is incredible to think that this ladies Rolex watch has lasted nearly 100 years and is still in wonderful condition. Rolex was founded in 1905 making this one of the earliest Rolex watches that we have had. Made in 1916, this ladies Rolex was fitted into a 9ct rose gold case together with a 9ct rose gold band that expands on the wrist making it so easy to wear all the time as well as being very comfortable. The dial is typical of this period by being made with the same technology that pocket watches were by being white enamel. The beauty of the enamel dials is that they are as white today as when it was made nearly a century ago. Quite often Rolex watches of this era had black Roman numerals with the red 12 that can be seen here. With the numerals set onto the white enamel dial, this makes it so easy to read day or night. 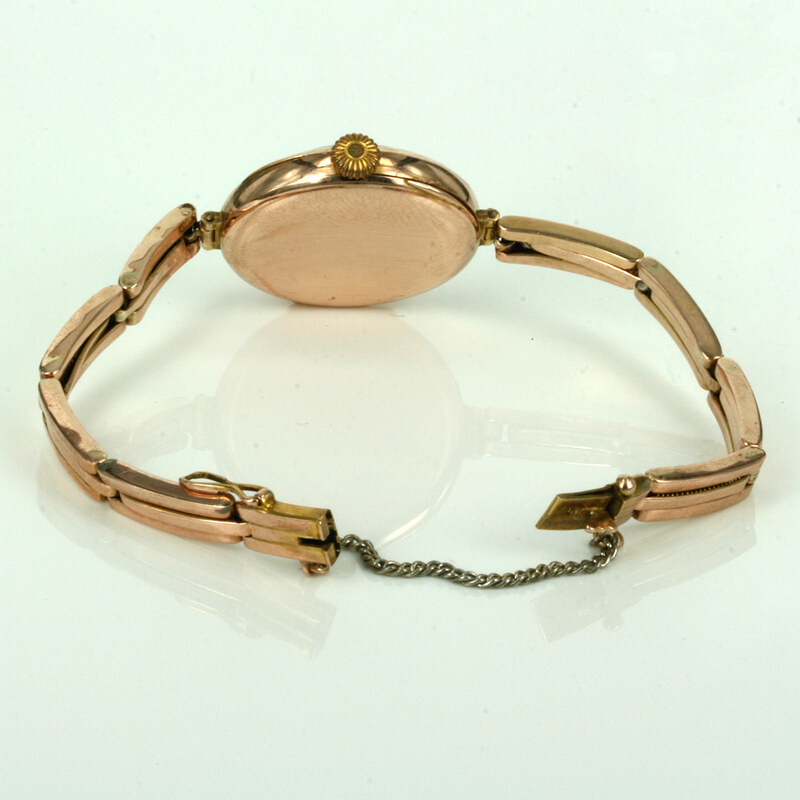 The watch case itself measures 26.1mm across plus the crown and has such a lovely feminine look to it so typical of this era. Inside the manual wind movement has just undergone a full service and comes with our 12 month warranty. With the band fitted with a safety chain for added security, this is such a wonderful example of one of the earliest Rolex watches that will always continue to be admired and loved. A real treasure for the right woman to appreciate and love.